Soror Fieri Facias is a Thelemite who associates with Blazing Star Oasis in the Valley of Berkeley, California. I learned about Thelema from a stranger that I met in a cafe in Berkeley a little over two years ago. When I read more of Crowley’s literature and of Thelemic literature in general, I felt like what I was reading was the articulated form of what I already inherently believed and operated on. Magick is the art and science of living with awareness, a sense of purpose and intention behind every action. It’s more to me than just ceremonial ritual. Those kinds of things are important to me as far as staying disciplined and cultivating my faculties of awareness and intention, but the real work is done in day-to-day life, in eating food, nourishing myself, going to work, and serving other people in the jobs that I do in my community and at Blazing Star. It’s how I choose to live my life and use my skills to better the environment around me with a sense of awareness. That is Magick to me. Thelema stands out to me because of its celebration of the individual, its celebration of the individual’s connection to divinity, and how the individual can have first-hand experiences in relation to that divinity how they may according to who they are as unique people. It doesn’t place arbitrary restrictions on people – every restriction in Thelema is necessary to the individual. Thelema doesn’t mean that restriction is wrong; discipline is very necessary, but – like I said – they’re not arbitrary. Every individual needs a different code, a different set of rules, a different formula of boundaries that is unique to them, which wouldn’t match for someone else. Thelema is a philosophy and a religion that allows for that. As cliché as it may sound, I love OTO for the fact that it’s an intentional community. It’s a group of people working together to celebrate themselves, each other, and the Mysteries. What a person gets out of that community is a sense of hope and support that a person wouldn’t get if they were isolated. It’s still a very mysterious organization to me. I feel like I’m always learning more about how it works. People in different places in the world come together in these little units and they get these handbooks and these regulations, and they step up in these positions of leadership, management, and service and they make it work together in accordance with their own True Wills. That is awesome and inspiring. I’m grateful to OTO for the people who volunteer to do so much work to make so much happen and that I am personally grateful to have a spiritual community that I can put effort into and see that I reap what I sow. I’m grateful for all of the members who have been around for a long time who have a lot to teach and a lot to share but who also show a sense of trust and confidence in me as a young and newer Thelemite to try new things and to share what I know and basically give me a platform to learn about myself and what I’m good at and what I’m not good at. For me, the most important practice of Magick, what I get the most out of, isthe LBRP or LRP. I find it to be very calming and empowering and reassuring in an interesting way. It feels different every time I do it and I never regret it when I do it. Also, when I’m in the groove of doing Liber Resh consistently throughout the day and consistently day after day, I feel more aware of time and that it’s passing. I’m grateful for the sense of noticing that, being aware of something outside myself. I think people get caught up in what they’ve heard about Aleister Crowley and get distracted very easily by the man himself, particularly how second-hand sources portray him. It’s important to read what he wrote and not what other people have written about him to get a clearer sense of who he was, how he lived his life, and how he saw himself as the Prophet of this philosophy. Also, I think that a lot of Thelemites get caught up in small potatoes arguments that prevent them seeing the larger picture, although that’s part of the experience, too. The larger picture is that this perspective of life, this philosophy and this religion, is in its infancy and is therefore just a trembling, little seed waiting to explode with potential; our small interpersonal conflicts are laughable in the face of what is possible with this way of living life. Also, there is a large lapse in the theory being integrated in people’s practice. I think too many Thelemites separate ceremonial ritual being Magick from going to the Temple for a class or making a chicken pot pie or writing a letter to your grandma also being Magick. Also, I think that a lot of Thelemites get tripped up in quoting Crowley and missing the spirit for the letter, obsessing over the letter, being correct and citations and years that things are published and all these really interesting facts… but I think they’re – a lot of the time – not particularly valuable. I think a lot of Thelemites really lose track of that. OTO is critical to Thelema because it’s a social laboratory for this spiritual science where we can experiment with each other, see what works and what doesn’t work. The history of OTO – as short as it is right now – is more or less a blueprint for what can extend out into the larger realm of society. And that’s its ultimate goal. 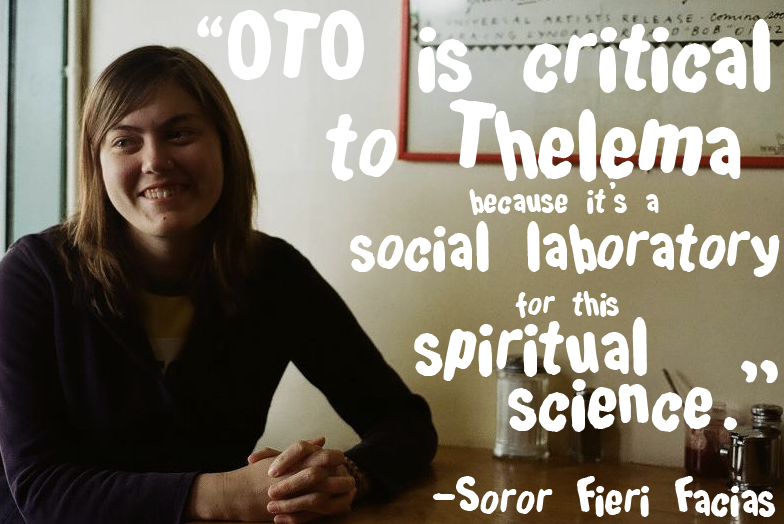 The OTO is a community that unites people together under the same philosophy and purpose. Without the services of the OTO I think we would all be floundering to commune with each other, get together to make things happen, and to promulgate the Law. I’m so grateful that OTO exists because it makes that a lot easier. Thelema gives me the symbolic alphabet, the language, the lens through which I naturally project meaning – deep meaning – onto what I experience in the world. As cheesy as that sounds, it makes the mundane parts of life magical and sacred and beautiful. Thelema provides me with a community – well, the OTO does but without Thelema the OTO wouldn’t exist – but I have a community of friends of a like mind and a like spirit that I can work alongside to fulfill my potential, which Thelema also encourages. Also, there’s a ton of beautiful poetry and literature that I can fill my imagination with. The word of the Law of this Aeon motivates me to respect myself and to respect others in a very real and practical way. Thelema works for people who want more than what’s on the surface of life. Thelema works for people who work. When I explain Thelema to people, I always tell them that it is based on “Do what thou wilt shall be the whole of the Law” and “Love is the law, love under will” and the relationship between those two sentences takes a lifetime to really comprehend and actualize. I always mention Crowley, too. I’m private with that stuff. For its own sake, I hope that OTO grows slowly so that the different bodies across the US and in other countries can adequately adapt to the needs of a larger, growing community. I also think if there’s some sort of explosion of interest that OTO could withstand it, and it might look like a trial by fire but I think that it would be successful. The point of what I’m saying is that I know it will grow, but at what rate, I’m not sure. In the next 10 years, I hope that there are more classes in these bodies that are geared toward the practical application of the philosophy of Thelema, and I hope that there’s more classes on the practical application of the lessons that are taught in M∴M∴M∴. Also, I hope that there’s always more opportunities for members of the bodies of OTO to express themselves creatively at whatever capacity. I feel generally more accepting of the fact that there is conflict, contention, and hostility between people in the world. Genuinely, I accept that more, and I see it with more of a sense of compassion than frustration or disapproval because I see it as stars straying from their paths. Even just that simple symbol of every man and woman is a star, of stars colliding, and stars, when they’re on their own path, they don’t interfere. That symbol gives me such a sense of understanding and compassion. I push myself more towards my ideals and towards my goals because thanks to the work that I’ve done with Thelema and the OTO. I’ve named them, and in naming them – my ideals and my goals and my purpose – they’re more achievable. As a whole, the Gnostic Mass serves the wonderful purpose of getting individuals together in a group – in a community – that benefit from the joint effort of the officers of the Mass to acknowledge themselves as divine. My favorite part of the Mass is the line “let the fire and the air make sweet the world” because, when I hear that, I think about how I should use my own mind and my own aspirations to make my environment a better place and to make my community a better place, to make it sweet and enjoyable. I’ve always found that line to be a reminder to do that. Like the OTO, Thelema can only grow. The more that the Law is promulgated, then the more individuals like myself will be exposed to it – only to realize that we already living this way! Thelema provides the practices, the lessons, and the community for us to live this Law better, and together. “My favorite part of the Mass is the line “let the fire and the air make sweet the world” because, when I hear that, I think about how I should use my own mind and my own aspirations to make my environment a better place and to make my community a better place, to make it sweet and enjoyable. I’ve always found that line to be a reminder to do that.” Great observation. I enjoyed reading your interview. Thanks for sharing. Inspiring and uplifting. Thank you! This reminds me of a small “Non-OTO” Lodge, in a certain large national non-OTO-Fraternity, within which one Brother recently told me that officer positions & lectures were not simply for the people “who do them best”, but were, in his opinion, a way for other new members to try to fulfill them to THEIR very best. And that it sometimes took real fraternal love for several older Brethren to trust the new candidates to “step up” to certain roles in memorizing lines, being punctual, bringing food, serving as role models to visiting brethren, et cetera. It is a reminder to me that at all OTO meeting I attend, the visitors, guests, and members ALL “have a lot to teach and a lot to share “. It’s important to me that I remind myself of that and govern myself accordingly by listening and encouraging others to “step up” to different responsibilities. 93 & thanks for reading!